Usage of Credit Card for any purchases has become common. End Customers use credit cards to make their payment for any purchases made. 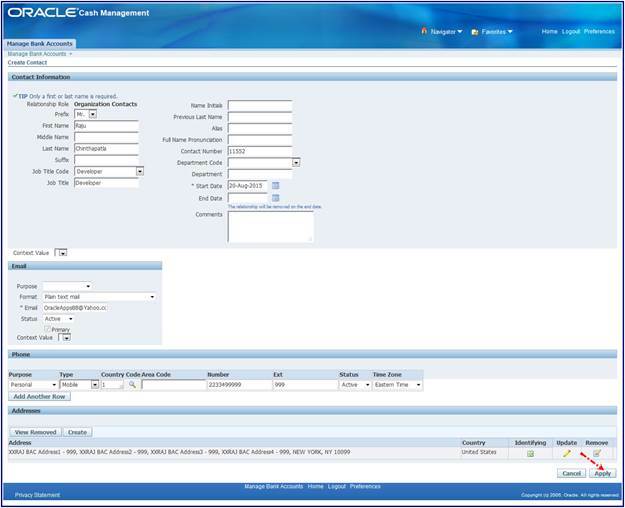 Client implementing Oracle EBS now has the facility to integrate Oracle EBS modules like iPayments, iReceivables, iProcurement etc with Credit Card payment functionality. Oracle EBS is now compatible to support either Gateway or Processor model of Credit Card Payment integration. 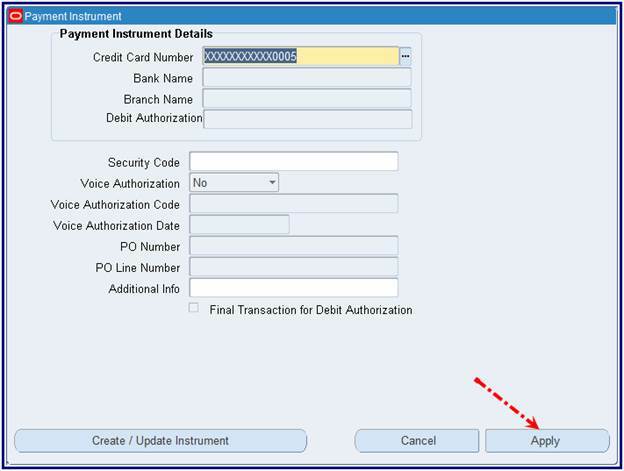 This document gives the basic mandatory setups that are to be done in Oracle Payments and Account Receivables module for credit card payment integration with iReceivables module. Credit Card payments shall also be setup and integrated for use in other EBS modules like Advanced Collections, iProcurement etc. The setups for integration with those modules are not shown in this document. The first part of the document will walk through all the setup stages required in Cash Management (CE), Receivables (AR), and Payments (IBY) in detail. The first step in the bank account creation is the bank definition. This form allows you to search for existing banks, view and update them or create new banks. 1. 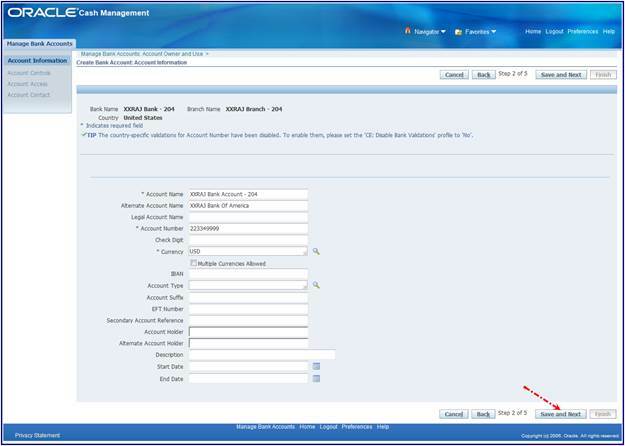 Navigate to the Manage Banks and Branches window, select the Banks tab, and select the Create button. 2. 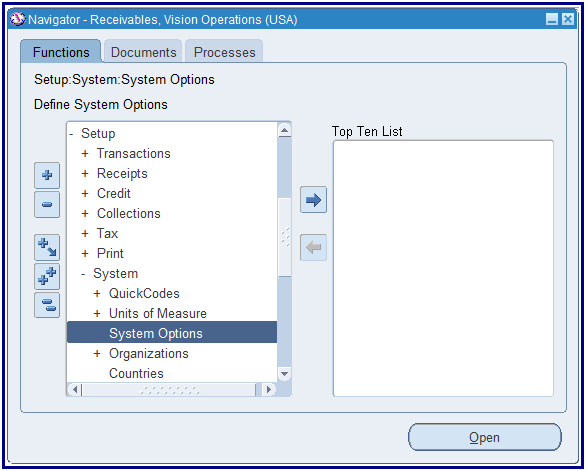 Select one of the two radio buttons in the Bank Options region. When creating a new bank, you can either create a new bank or add bank details to an existing party defined in your Trading Community. 3. Enter a country name or select a country from the list of values. This is a mandatory field. 4. Enter the Bank Name. This is a mandatory field. 5. (Optional) Enter an Alternative Bank name, Short Bank Name, Bank Number, Description, Taxpayer ID, Tax Registration Number, Inactive Date. 6. Select Finish to save your bank or select Save and Next to enter Bank Address information. Country: The name of the country where the bank is located. Bank Name: The name of the bank. Alternate Name: You can enter an alternate name for your bank. This is particularly useful if you do business in Japan, which allows you to enter both Kanji and Kana values for your bank name. The system does not use the value. It is for your reference only. Short Bank Name: This may be an alpha or a numeric reference. Bank Number: Identification number of the bank. Payables uses this information to identify the bank in payment formats that use electronic payment methods. The combination of Bank Number, Branch Number, and Country must be unique. You can maintain several addresses for the bank in case, for example, when the bank has different mailing and physical locations. One of the addresses has to be marked as a primary or identifying. 1. 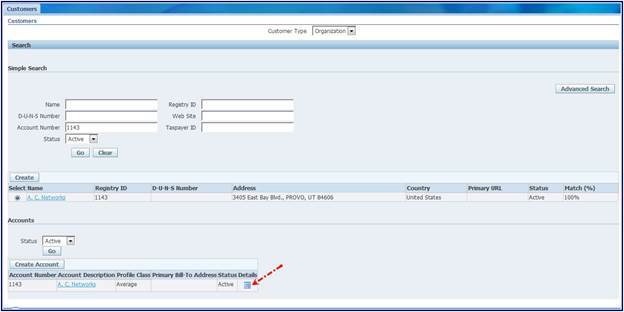 Navigate to the Create Bank Address window and select the Create button. 2. Enter a country, or select one from the list of values. 3. Enter the remaining country specific address details. 4. Select Apply to save the address. 5. Select Finish to complete the bank creation or select Save and Next to enter Bank Contact Information. · Address: The mailing address for the bank. · Country: The name of the country where the bank is located. · Identifying: In many countries a fiscal code is the principal means of identifying and querying suppliers. The fiscal code is unique across all entities and appears on all official documentation. 1. Navigate to the Create Bank Contact window and select the Create button. 2. Enter Contact Information. You need only enter a first or last (Family) name, a Registry ID, and Start Date. 3. Optionally enter Email, Phone, and Address information for the contact. 4. Select Apply to save the contact. 5. Select Finish to complete the bank creation.  Name: Name of your contact person. · Phone: Direct number to your bank contact. · Email: Email address for your contact at the bank. · Address: The mailing address for your contact. Update: Select this button to change any information as needed. 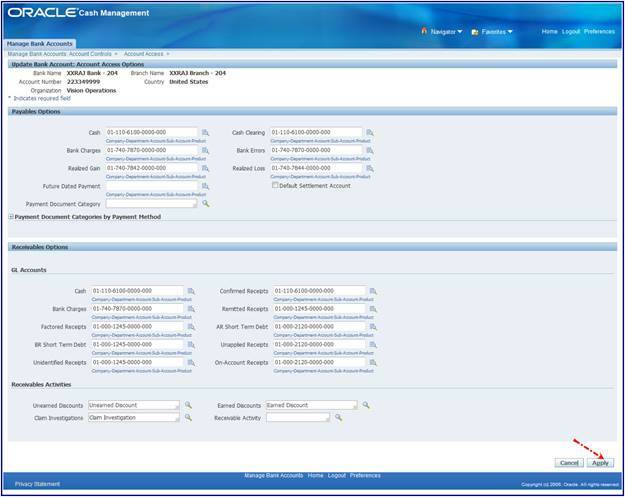 Navigate to the Manage Banks and Branches window, then select the Bank Branches tab. Bank branch creation is the next step after the bank creation. This page allows you to search for existing bank branches, view and update them or create new bank branches. You may conduct a Simple Search by filling in information in one of the following fields, and then clicking the search icon: Branch Name, Branch Number, EDI Location, Alternate Branch Name, Country, or Bank Name. 1. 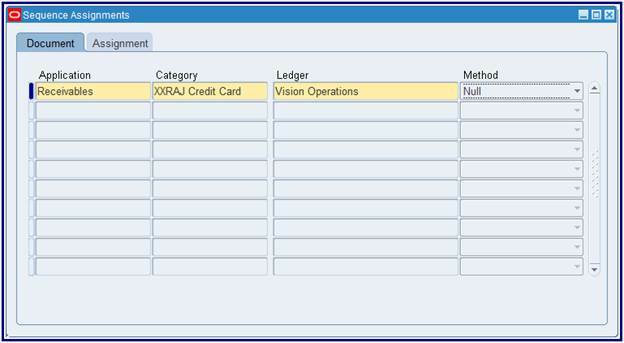 Navigate to the Manage Banks and Branches window, select the Bank Branches tab, and select the Create button. 2. Enter the Country and Bank Name for which you are creating the branch or select from the list of values and select the Continue button. 3. 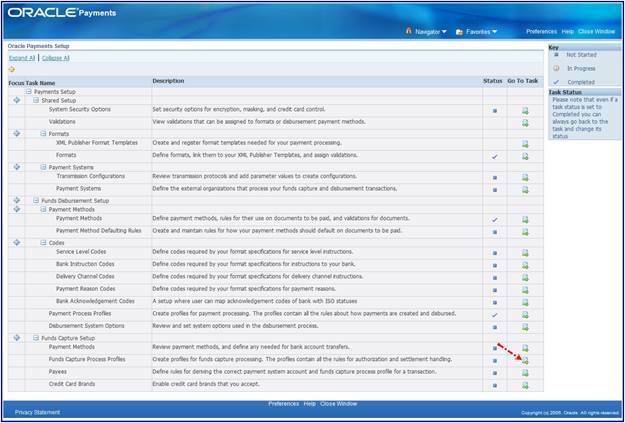 Select one of the two radio buttons in the Branch Options region to indicate if you are creating a new branch or adding branch details to an existing party defined in your Trading Community. 4. Enter the Branch Name (required). 8. Select Finish to save your branch or select Save and Next to enter Branch Address and/or Branch Contact information. 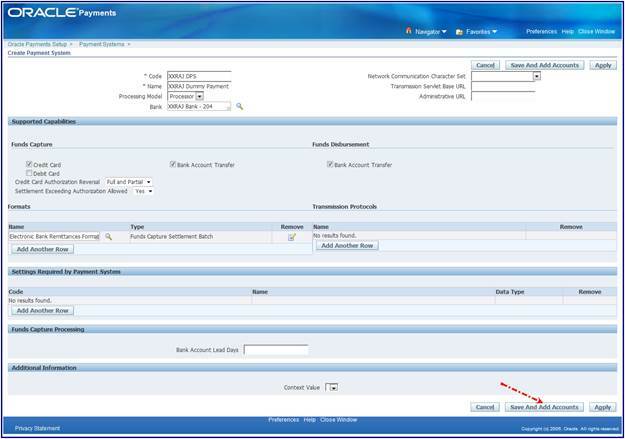 Entering Branch Address Details, and supplying Contact Information are the same processes as described when entering this information for banks. Branch Name: The name of the bank branch. Alternate Branch Name: You can enter an alternate name for your bank branch. This is particularly useful if you do business in Japan, which allows you to enter both Kanji and Kana values for your bank branch name. The system does not use the value. It is for your reference only. Branch Number(Also Known as ‘Transit Routing Number’): The bank branch number. 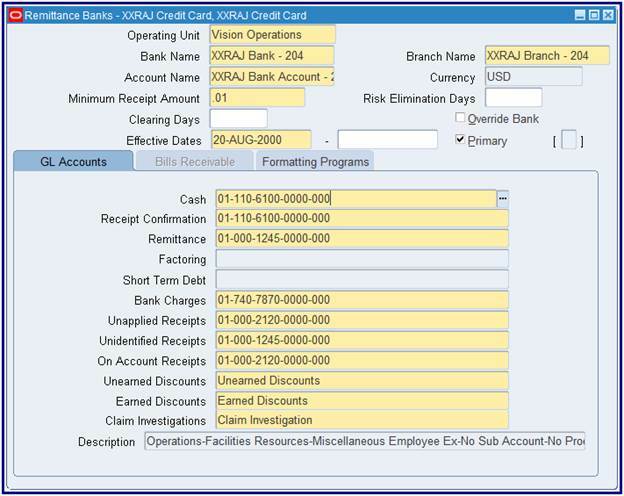 Payables used this information to identify the bank branch in payment formats that use electronic payment methods, in creating positive pay files, and when printing the MICR line on checks. Note: For banks based in the United States, enter the American Banking Association nine­digit transit routing number in this field. Also, if you use the National Automated Clearing House Association (NACHA) electronic payment format, then include the bank branch number on both internal and supplier banks. The combination of Branch Number, Bank Account Number, and Country must be unique within a bank. The length of the BIC will be validated at entry time. If the bank branch is used for SEPA payments, BIC is mandatory. EDI Location: The Electronic Data Interchange (EDI) location code for this bank. EFT Number: Your enterprise's EFT (electronic funds transfer) user number. This number is used to identify your company on any EFT transmissions with the bank. Disable the 'CE: Disable Bank Validations' profile option to enter the branch number. Issue 1: In R12, the mandatory feature of bank account validation is causing issues for customers. A means is needed to be able to "turn-off” the validations. Impact of: profile option 'CE: Disable Bank Validations' Yes or No. Issue 2: Validation Rule Error - "Routing Transit Number" does not accept any number of digits in "Create Bank Branch : Bank Branch Information"
Validation rule error - "Routing Transit Number" would not accept any number of digits in "Create Bank Branch : Bank Branch Information" setup. When 10+ digits were entered, received error that less than 10 digits is required; however, the field does not accept less than 10 digits either in the field either. Issue 3: Error: The Check Digit validation for Routing Transit Number has failed. Please Enter a Correct value for the Rounting Transait Number. Once you are done with the bank branch creation, you can proceed to the bank account setup. This page allows you to search for existing bank accounts, view and update them or create new bank account. 1. Navigate to the Manage Bank Accounts window and select Create. 2. Enter the Country, Bank Name and Branch Name for which you are creating this account and select Continue. 3. Enter the Bank Account Owner; the legal entity that owns the account. 4. Select the types of functions that this bank account is going to be used for: Payables, Payroll, Receivables, or Treasury or all. If the Treasury option is disabled, you have not linked this bank branch to the counterparty in Treasury. Enter information in the Account Information tab. For details of the fields, see Bank Account Window reference. Account Name: The name you use to refer to the bank account. You may want to use a name that indicates the usage of the bank account. Alternate Account Name: The alternate name for your bank account. You can enter an alternate name for your bank account. This is particularly useful if you do business in Japan, which allows you to enter both Kanji and Kana values for your bank account name. The system does not use the value you enter here unless you enable the Sort by Alternate Fields Payables option. If you enable that option, then Payables uses the alternate name when it sorts reports by bank account name. Short Account Name: This may be an alpha or a numeric reference. Account Number: The bank account identification number. The combination of Bank Account Number, Bank Branch Number, Account Use, and Currency must be unique for each bank. Refer to your country­ specific documentation on validation that the system performs on the bank account number for specific countries. Check Digit: The value used to validate the authenticity of your bank account number according to country specific bank account validation requirements. This value is provided by your financial institution. Currency: Currency for a bank account. The default value is your ledger currency. Multiple Currencies Allowed: If you do not enable the Use Multiple Currencies Payables option, then Payables does not allow you to change this value. If you select your ledger currency as your bank currency, then you can enable the Use Multiple Currencies Payables option and use this bank account to pay foreign currency invoices. If you select a different currency than your ledger currency in this field when you define Payables Payment Documents, then you will only be able to select payment formats that you define in that currency. Also, you will only be able to pay invoices that you enter in this foreign currency. IBAN (International Bank Account Number): The IBAN is an international standard that uniquely identifies the account number of a bank's customer. It is used in euro­zone countries to help ensure error­free cross­border payments. The IBAN is validated upon entry. If you provide the IBAN on your supplier's bank account, then we recommend that you also provide the BIC for that supplier's bank branch. Account Type: Bank account type. 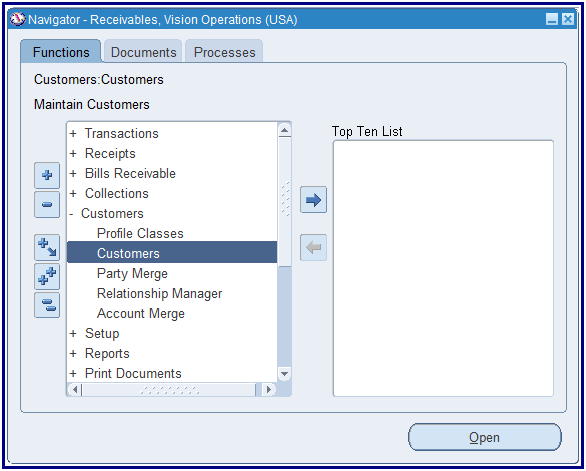 The seeded values are SAVING, CHECKING and OTHER.You can define additional bank account types in the Oracle Cash Management Lookups window. For example, you could add Controlled Disbursement for your internal bank account. Checking would be used for a supplier or customer bank account. Account Suffix: An identifier for your bank. Secondary Account Reference: Additional account reference. For your reference only. Account Holder: Name of the person or organization within your organization who is responsible for this account (optional). Description: Description of the Bank Account. For your reference only. Alternate Account Holder: The alternate name for your bank account holder. If you are using this internal bank account to process NACHA­formatted electronic payments, then enter the name of the tax reporting entity that will be referenced by the payment files, exactly as it appears in the Reporting Entity window. If you do not use this bank account for NACHA­formatted payments, then this value is not used by the system and is for your reference only. Start Date: Enter the start date if you want to limit the time during which this supplier site uses this bank account as the primary bank account for receiving electronic payments in the bank account currency. End Date: Enter the end date if you want to limit the time during which this supplier site uses this bank account as the primary bank account for receiving electronic payments in the bank account currency. Cash: Enter the cash account number. If the cash account number is in 5 segmental format, such as Company­ Department­Account­Sub­Account­Product. enter the number as 01­000­1110­0000­000. Cash Clearing: Enter the cash clearing account number. If the cash clearing account number is in 5 segmental format, such as Company­Department­Account­Sub­Account­Product. enter the number as 01­000­1110­0000­000. Bank Charges: Enter the bank charges account number. If the bank charges account number is in 5 segmental format, such as Company­Department­Account­Sub­Account­Product. enter the number as 01­000­1110­0000­000. Bank Errors: Enter the bank errors account number. If the bank errors account number is in 5 segmental format, such as Company­Department­Account­Sub­Account­Product. enter the number as 01­000­1110­0000­000. Foreign Exchange Charges: Enter the foreign exchange charges account number. If the foreign exchange charges account number is in 5 segmental format, such as Company­Department­Account­ Sub­Account­Product. enter the number as 01­000­1110­0000­000. Agency Location Code: If your enterprise is a United States federal agency, then you might need to enter an Agency Location Code. This code is assigned by the United States Department of the Treasury to identify the source of financial transactions. Netting Account: Select Yes or No. When netting receipts, both receipts must be in the same currency. Minimum Target Balance: You can define a minimum target balance for bank accounts. The target balances help you determine the minimum balance for bank accounts that you include in your cash position. Maximum Target Balance: You can define a maximum target balance for bank accounts. The target balances help you determine the maximum balance for bank accounts that you include in your cash position. Minimum Payment Amount: You can opt to pay the minimum payment available. Minimum Receipt Amount: This is the minimum amount in this currency that must be specified when you create automatic receipts with this payment method. Rounding Factor: Select the method the factor in amounts are displayed. Rounding Rule: Select the rounding rule. The options are Round Up, Round Down, or Nearest. 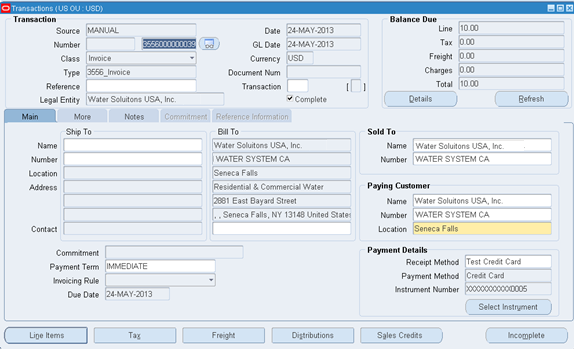 Cash Flow Display Order: Cash receipts minus cash disbursements from a given operation or asset for a given period. 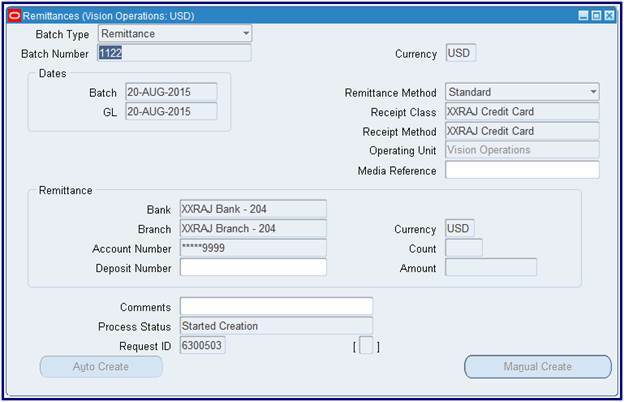 Multiple Currency Payments: Enable this option if you want to use this bank account to pay invoices entered in multiple currencies. You can select this option only if the Use Multiple Currencies Payables option is enabled and if the bank account is in your ledger currency. Allow Zero Payments: Enable this option to allow zero­amount payments from this bank account. Pooled Account: If you use Automatic Offsets and you want to associate multiple companies with this bank account, then enable this option. 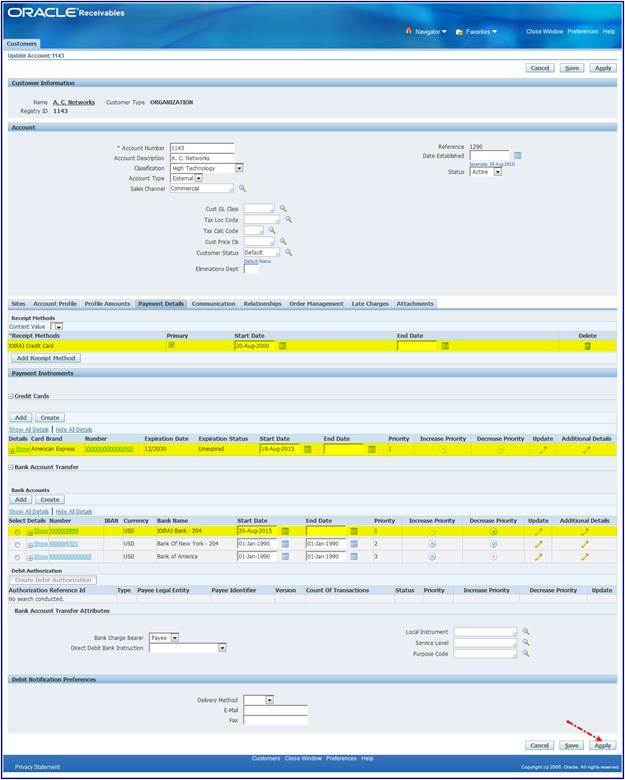 When you enable the Automatic Offsets Payables option, Payables creates one offsetting liability distribution for each invoice distribution. 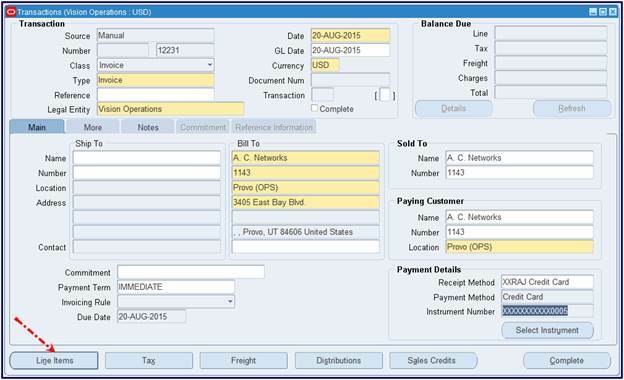 If you then pay the invoice from a pooled bank account, then which Payables accounts for the invoice payment, Payables creates one corresponding cash accounting entry for each liability distribution. In addition, Payables builds the cash account based on the Cash Account defined for the bank account, and on the account segments of the liability lines. If you do not use a pooled account, then when Payables accounts for the payment, it creates a single accounting entry for the Cash Account, and uses the Cash Account that is defined for the bank account without modifying any account segments. Maximum Outlay: The largest currency outlay that you allow for a payment batch for this bank account. 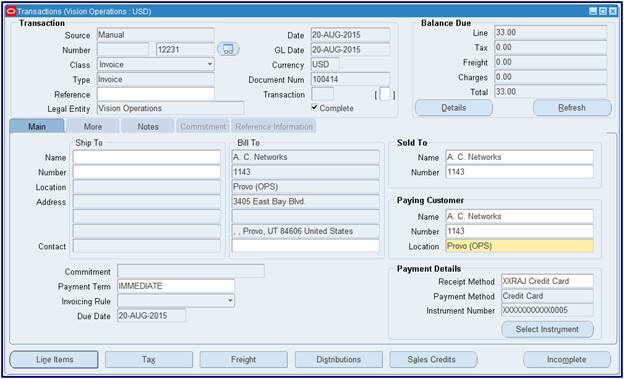 If the total outlay of a payment batch exceeds the maximum outlay for the payment batch, then Payables displays a warning, but allows you to continue processing the payment batch. The Maximum Outlay for a bank account defaults from the Payables Options window. When you initiate a payment batch using the bank account, Payables uses the bank account's Maximum Outlay as a default. You can override this default. Minimum Payment: The lowest payment amount that you allow in a payment batch. Maximum Payment: The largest payment amount that you allow in a payment batch. Multiple Currency Receipts: Check this check box to define the bank account as a multiple currency bank account. A multiple currency bank account is an account that accepts payments in more than one currency. 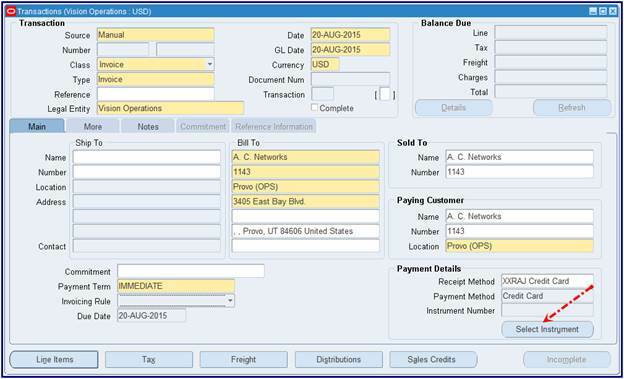 Payables Matching Order: Select Transaction or Batch. Float Handling: Select Error or Ignore. 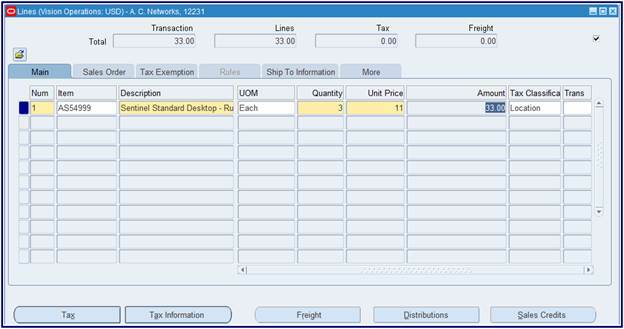 Receivables Matching Order: Select Transaction or Batch. Exchange Rate Type: AutoReconciliation selects the exchange rates for the transaction currency using the Exchange Rate Type that you specify. You can choose any Exchange Rate Type. Bank Statement GL Date: The accounting date used to clear the statement. Bank Statement Date: The closing date of the statement. Statement Line Date: The date the transaction cleared the bank. Transaction Creation Date: The date the transaction was created. 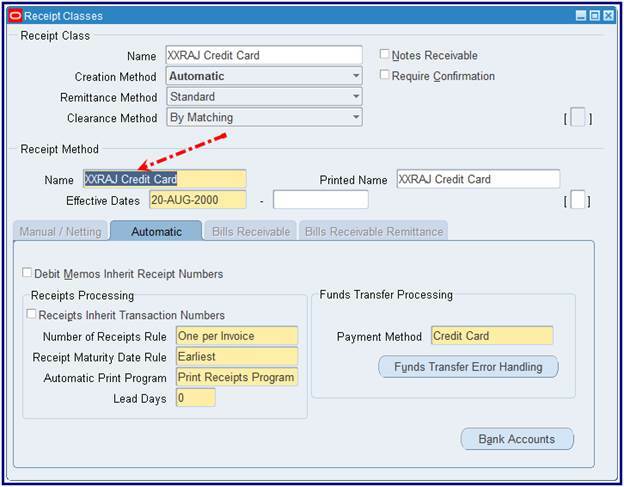 Transaction Creation GL Date: The accounting date used to create the transaction. Transaction Exchange Rate Date: The date associated with the exchange rate that was used to create the transaction. 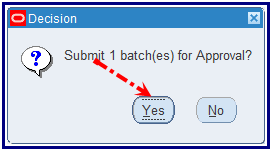 Use Reconciliation Open Interfaces: Enable the checkbox if you use this feature. Open Interface Matching Criteria: This parameter specifies the matching criteria for open interface transactions. The default is Transaction Number. If you want to reconcile bank statement lines to Treasury settlements, then select the Date and Amount option. Float Status: Status of open interface transactions that are available for clearing and reconciliation. If you reconcile only Treasury settlements in the Reconciliation Open Interface, then enter the Reconciled status code. Clear Status: Status of open interface transactions that have cleared or reconciled. 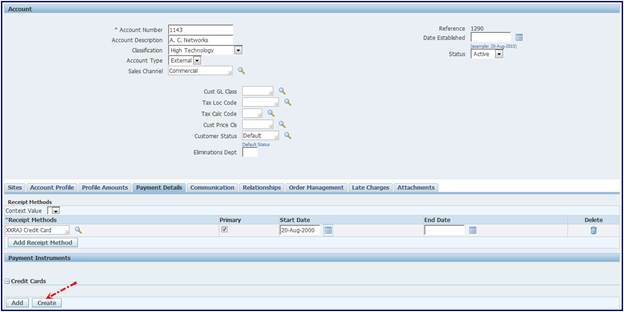 If you reconcile only Treasury settlements in the Reconciliation Open Interface, then enter the Available status code. Tolerance Amount: You enter reconciliation tolerances as an amount. Tolerance Percentage: You enter reconciliation tolerances as a percentage. Operating Unit # 2 to use this bank account only in Payables. If you choose a particular functional area for you bank account, you will be taken to the page where you may be required to enter certain bank account attributes that are unique for this particular functional area. 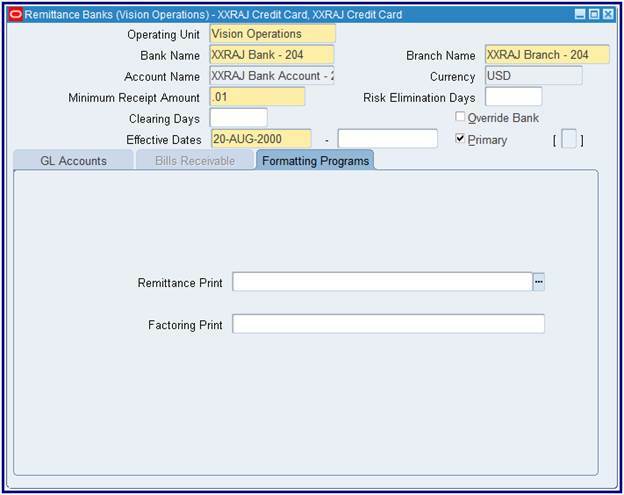 It is also important to note that if you grant Operating Unit # 1 access to this bank account in Payables and Receivables, then all users who have been granted access to Operating Unit #1 will be able to use this bank account in Payables and Receivables (provided that the functional access has been granted to these uses as well). Enter information in the Account Contact tab. Receivables uses receipt methods to account for your receipt entries and applications. Receipt methods also determine a customer's remittance bank information. Note: You define receipt methods in the Receipt Classes window. You can assign multiple remittance banks to each receipt method, but only one bank account can be the primary account for each currency. For each remittance bank branch account assigned to a receipt method, you must define all of your receipt accounts. You can then assign your receipt methods to your receipt sources to use with your AutoLockbox and manually entered receipts. bank per currency. At least one of these remittance banks must be primary. The receipt class you assign to each of your receipt methods determines the processing steps that Receivables requires for receipts that you create using this receipt method. These steps include whether to require confirmation, remittance, and bank clearance for receipts that you create with a specific receipt class. See: Receipt Classes. 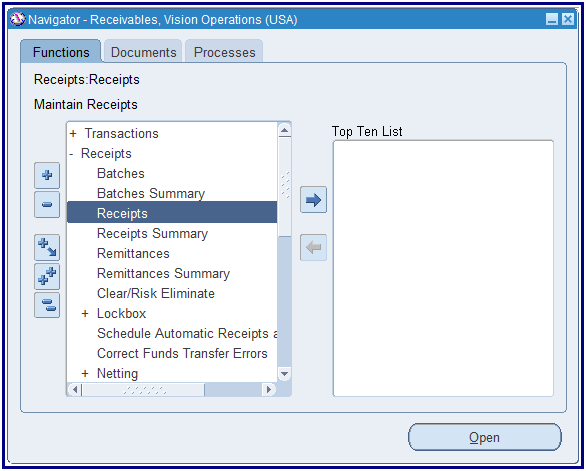 Receivables requires that you specify a receipt method when you create your automatic receipts through the Receipt Batches window. 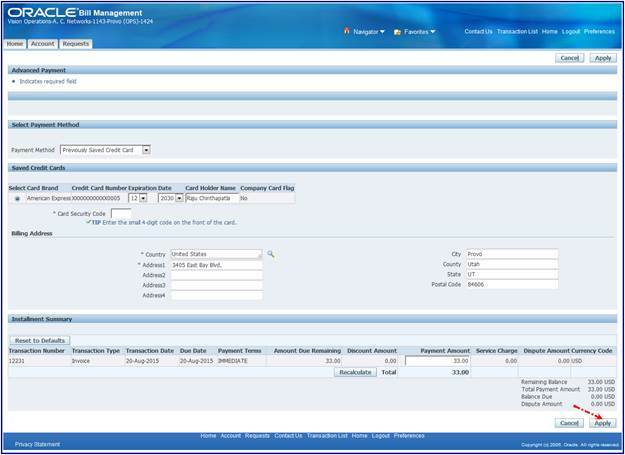 You also assign receipt methods to invoices when you manually enter them in the Transactions window. If an invoice will be automatically paid by credit card, direct debit, or bills receivable, then you must assign an automatic receipt method to the invoice. Note: Enable automatic correction of funds transfer errors by mapping error codes to corrective actions, for each automatic receipt method. See: Enabling Automatic Funds Transfer Error Corrections. 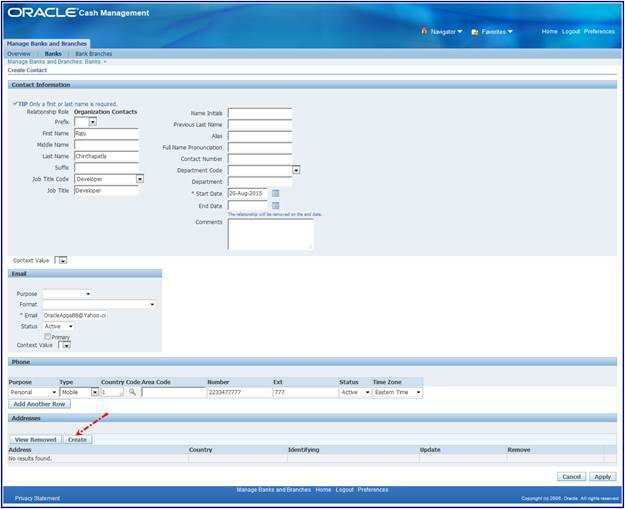 You can assign all receipt methods to transactions in the Transactions window, except for bills receivable remittance receipt methods. You enter bills receivable remittance receipt methods in the Remittances window. 1. Navigate to the Receipt Classes window. 2. Enter a unique Name for your Receipt Class. 3. If you are creating a Notes Receivable receipt class, check the Notes Receivable box. You cannot change this attribute after you assign a receipt method and then save this receipt class. 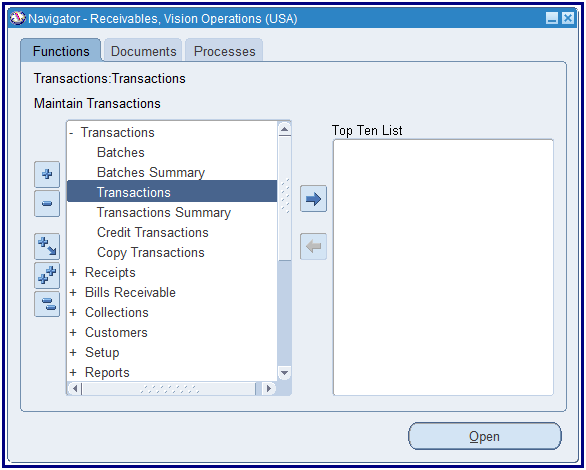 See: Notes Receivable, Oracle Receivables User Guide. 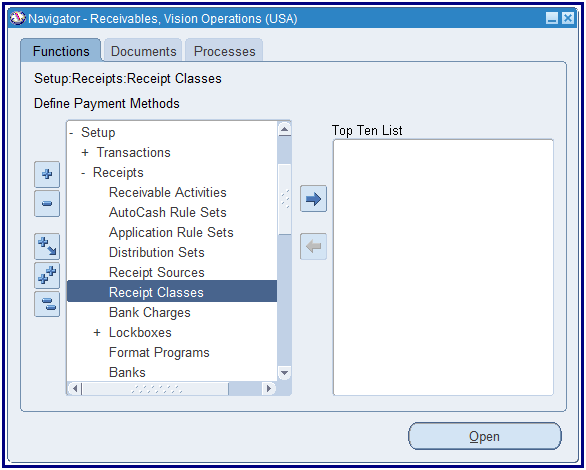 If you choose Automatic, you can create receipts with this receipt class using the Automatic Receipt program. 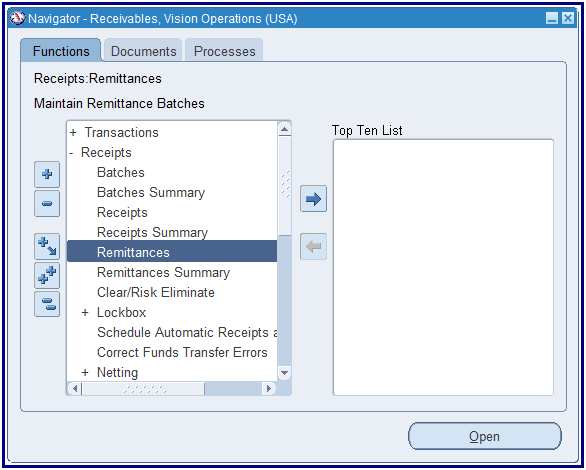 See: Creating Automatic Receipts, Oracle Receivables User Guide. In addition, for these receipts, Oracle Payments is responsible for the funds capture process. See: Enabling the Funds Capture Process. 5. To require automatic receipts assigned to this receipt class to be confirmed before they can be remitted, check the Require Confirmation box. 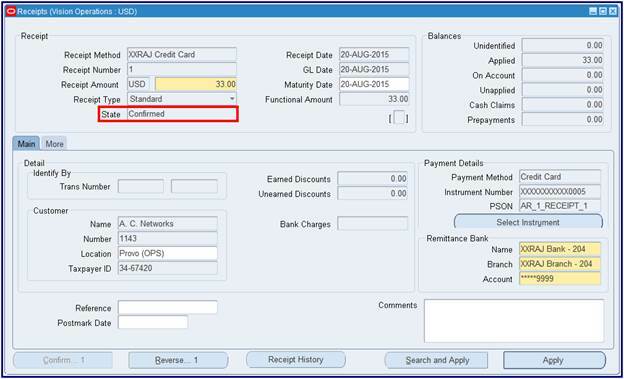 Check this box to confirm automatic receipts using this receipt class in the Confirm Automatic Receipts window. (This will not be used in this example) If you are defining a receipt class for use with ACH bank account transfers, then you should not check this box. Standard: Use the remittance account for automatic receipts or for standard bills receivable assigned to a receipt method with this receipt class. Note: If the creation method is Automatic, then you cannot select No Remittance as the Remittance Method. 1. Directly: Choose this method if you do not expect the receipts to be remitted to the bank and subsequently cleared. These receipts will be assumed to be cleared at the time of receipt entry and will require no further processing. Choosing this method is the same as setting Require Bank Clearance to No in previous releases of Receivables. 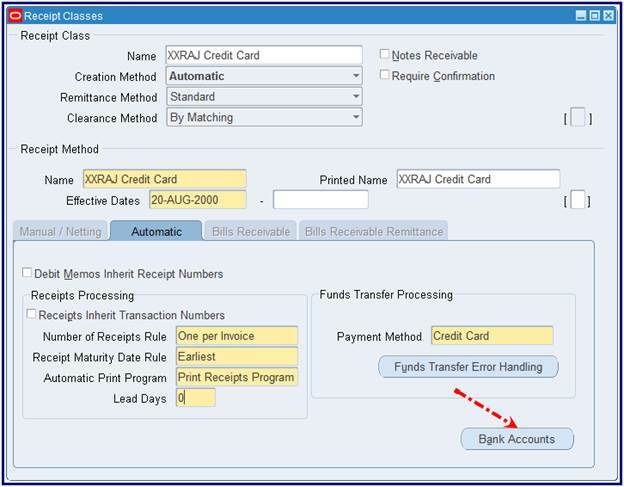 By Matching: Choose this method if you want to clear your receipts manually in Oracle Cash Management. 2. Enter the receipt method to assign to this receipt class. See: Receipt Methods. 1. Enter a unique Name for your receipt method, then enter how you want this receipt method to be printed on your statements in the Printed Name field. The default Printed Name is the receipt method name. 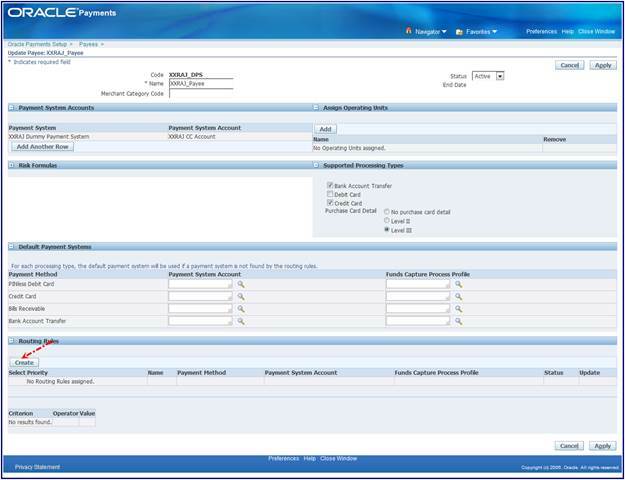 Note: Oracle Receivables lets you create a receipt method only if there is no transaction type, adjustment, or receivable activity with the same name. 2. Enter the range of Effective Dates for this receipt method. The default start date is the current date, but you can change it. If you do not enter an end date, this receipt method will be active indefinitely. 3. To assign the same transaction number to the debit memo generated when you create a debit memo reversal, check the Debit Memo Inherit Receipt Numbers box. Do not check this box if you want Receivables to generate unique debit memo numbers automatically. 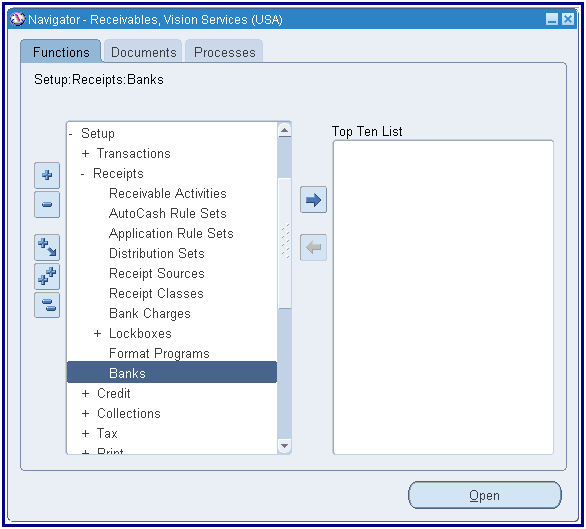 See: Reversing Receipts, Oracle Receivables User Guide. 4. If the receipt class associated with this receipt method has a Manual or AP/AR Netting creation method, then skip to the last step. 5. To ensure that the receipt number is always the same as the transaction number to which it is applied, check the Receipts Inherit Transaction Numbers box. This option helps you track Automatic Receipts. Do not check this box if you want Receivables to generate document numbers for Automatic Receipts assigned to this receipt class and receipt method. 6. If the receipt class associated with this receipt method has an Automatic creation method, enter a Number of Receipts Rule (see Number of Receipts Rules above). 7. Enter a Receipt Maturity Date Rule. Receivables uses this rule to pay invoices that have different due dates with a single receipt using this receipt method. Enter Earliest if you want the receipt maturity date to be the earliest due date of all of the invoices that your receipt covers. Enter Latest if you want the maturity date to be the latest due date of all of the invoices that your receipt covers. 8. Enter the Automatic Print Program for transmissions using this receipt method. Receivables provides one standard receipt print program to format the output of your payment selection and creation programs when you physically create the receipt document. If you need a different receipt print program format, you must copy this standard receipt print program, and modify it accordingly. 9. Specify a number of Lead Days. 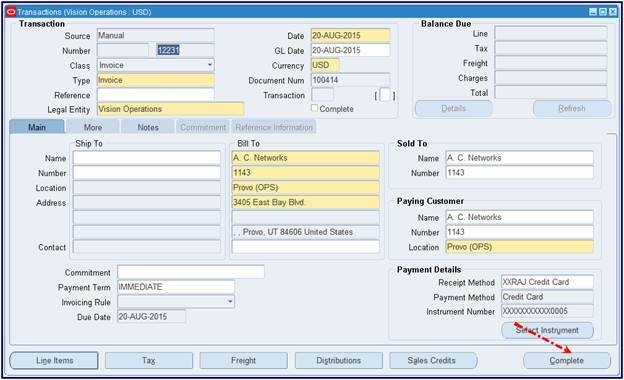 Lead days indicate the number of days before the invoice due date that an invoice can be selected for application by the Automatic Receipts program using this receipt method. Select Credit Card for transactions to be paid by credit card. Select Bank Account Transfer for transactions to be paid by ACH (Automated Clearing House) transfer. For transactions to be paid by direct debit, create a new receipt method or use an existing receipt method, and assign or define a new EFT­specific payment method. 11. 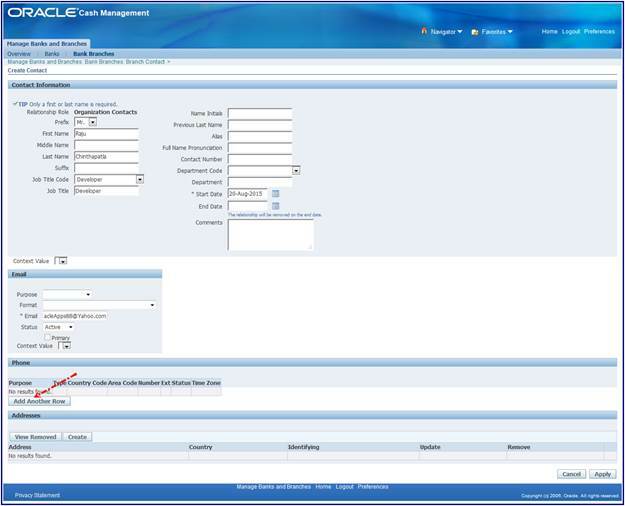 Select Funds Transfer Error Handling to enable the automatic correction of funds transfer errors. See: Enabling Automatic Funds Transfer Error Corrections. 12. Save your work. 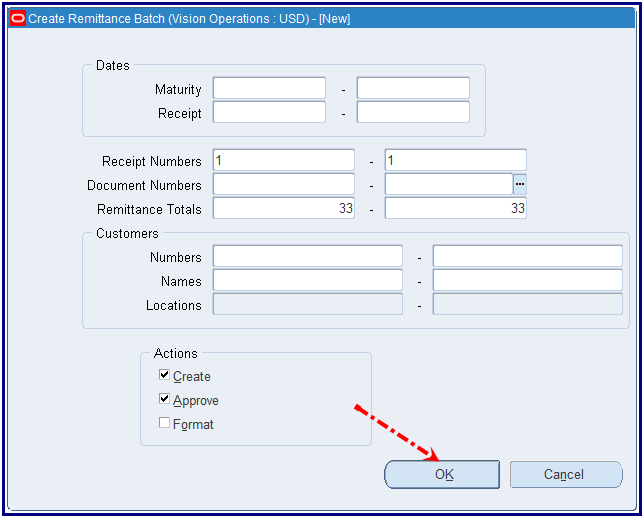 To assign a remittance bank to this receipt method, see: Assigning Remittance Banks. 2. Enter general Remittance Bank information, such as Bank, Branch, Account Name, and range of Effective Dates. You can only select active banks and bank branches. 3. If the creation method of the receipt class is Automatic, enter a Minimum Receipt Amount. This is the minimum amount in this currency that must be specified when you create automatic receipts with this receipt method. Note: You can also define a minimum receipt amount at the customer profile level. Receivables uses the larger of the two minimum receipt amounts when creating automatic receipts. 4. 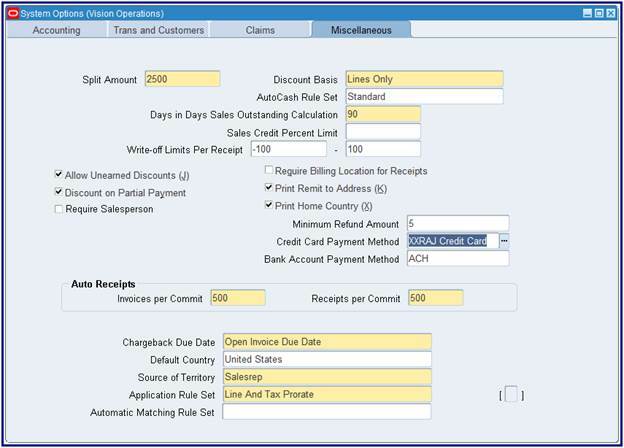 If the remittance method for this receipt class is either Factoring or Standard and Factoring, specify the number of Risk Elimination Days for receipts created with this receipt class (optional). When you factor receipts, Receivables creates a short term debt to account for your risk in case of customer default. When you run the Automatic Clearing program to clear or risk eliminate these receipts, the debt is cleared y days after each receipt's maturity date, where y is the number of risk elimination days that you enter here. 5. If the remittance method is not No Remittance, enter the number of Clearing Days for receipts created with this receipt class (optional). Remitted receipts are cleared x days after their maturity date, where x is the number of clearing days that you enter here. Factored receipts are cleared immediately on the remittance date. 6. To be able to override this bank during the remittance process, check the Override Bank box. 7. If you do not want this to be the primary remittance bank account in this currency for this receipt method, uncheck the Primary check box. You can only assign one primary remittance account per currency to your receipt method. Receivables ensures that at least one remittance account per currency is primary. 8. 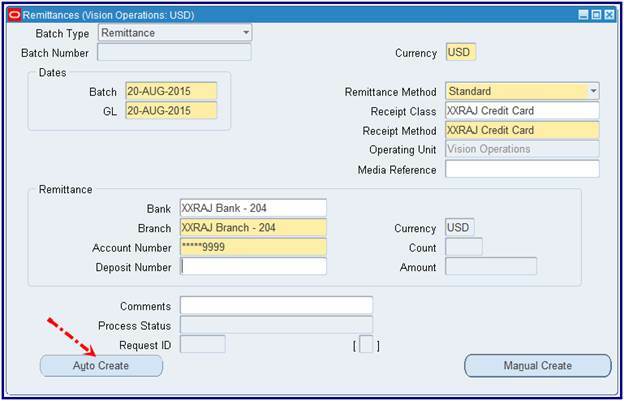 In the GL Accounts tabbed region, enter GL Account information for this remittance bank. Note: Cash Account, Receipt Confirmation Account and Remittance Account cannot be updated once the record has been saved. Therefore if incorrect data is entered it will require a new receipt method. 9. In the Unearned Discounts and Earned Discounts fields, select an unearned discount activity type and an earned discount activity type from the lists of values. 10. 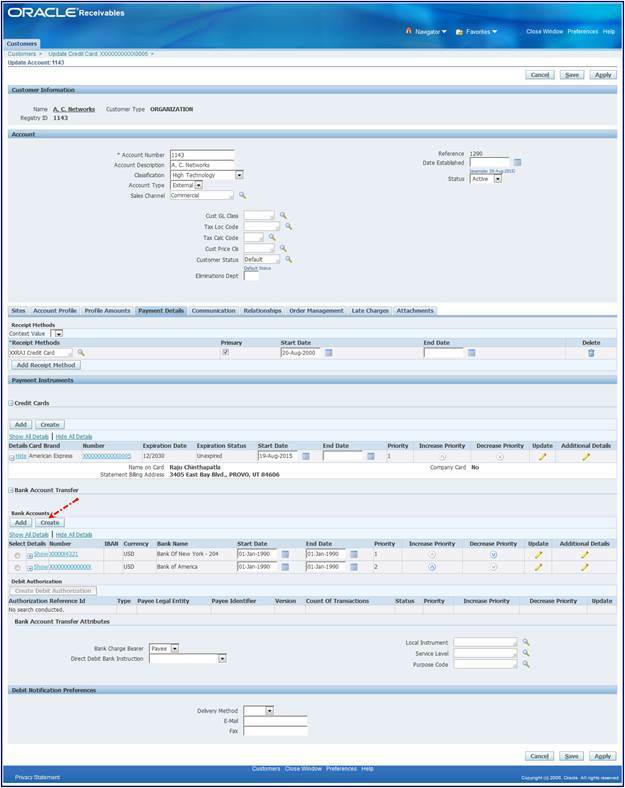 If using Oracle Trade Management, then in the Claim Investigations field, select a claim investigation activity type. 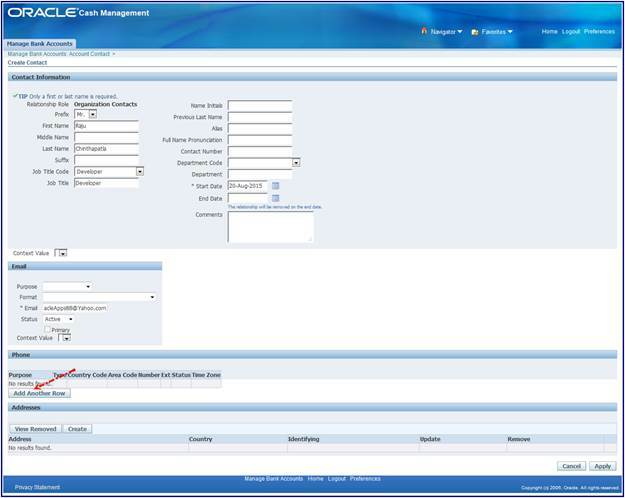 Ensure the Receipt Method Name mentioned in the receipt class is linked correctly in Payee Routing Rules. 11. 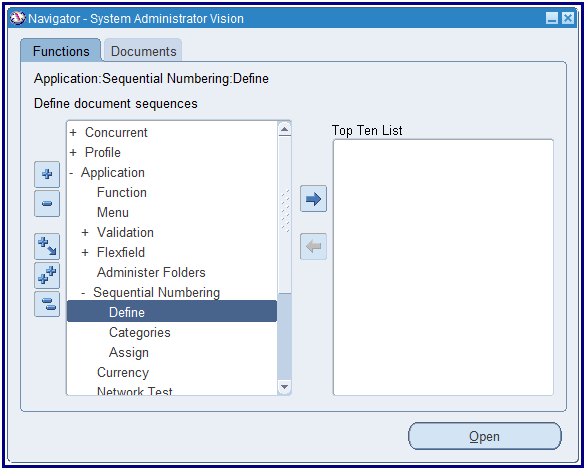 If the creation method of the associated receipt class is Automatic, open the Formatting Programs tabbed region, then enter formatting program information. To run a printing program when you format remittance batches for receipts remitted to you using this receipt method, enter a Remittance Print program. When you factor your remittances, Receivables notifies your print program so that it functions accordingly. You can use this program to create and send remittance advice to customers to whom you assign this receipt method. To run a factoring print program when you format your batches of remitted receipts for this receipt method, enter a Factoring Print program. When you factor your remittances, Receivables notifies your factoring print program so that it behaves accordingly. You cannot enter a factoring transmission program for this receipt method if your bank branch account's factoring creation medium is magnetic medium. Note: This document is for customers NOT using real time bank account processing by integrating with a backend payment system. 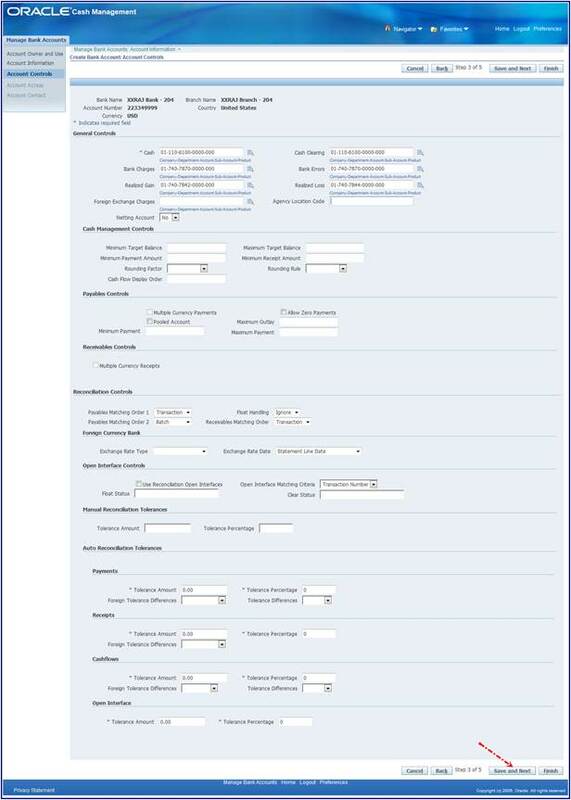 Setups in the document can be used to process dummy authorization and settlement requests in order to successfully create and remit bank account receipts. 11i Oracle iPayment is replaced with a brand new product called Oracle Payments in Release 12. This new product has extended functionality for funds capture (inbound payments) and funds disbursement (outbound payments) processing. In Release 12, both Oracle Receivables and Payables have dependency on Oracle Payments implementation. For funds capture processing, minimum implementation of Oracle Payments is mandatory even if realtime payment processing functionality is not used. If real time payment processing functionality is used, extensive setups as outlined in Oracle Payments implementation guide are needed. 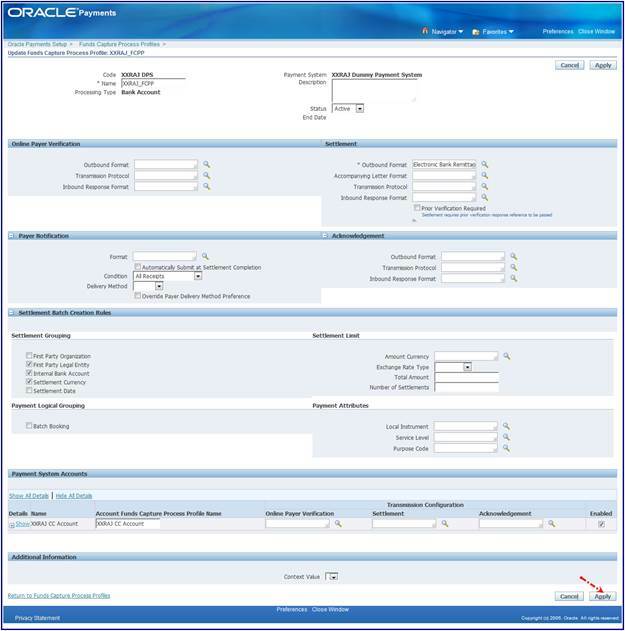 This note will document the setup's needed in Oracle Payments for merchants implementing Receivables (funds capture) without using real time payment processing. If these setups are not performed, receipt and remittance batches will fail with error "INVALID_PAYEE: Invalid payee identifier". Existing 11i customer had the ability to configure receipt class/method in such a way that realtime payment processsing can be turned off. This was done by setting payment type and merchant_ref to null. 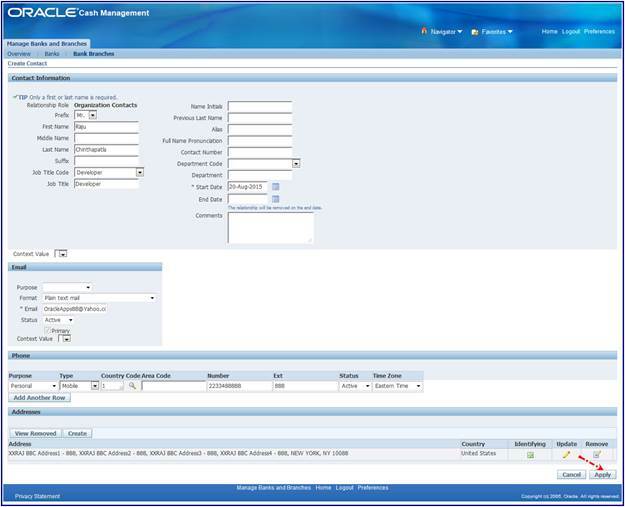 In Release 12, merchant_ref was obsoleted and replaced with Payment Method, created in Oracle Payments. This payment method is mandatory and for merchants upgrading from 11i, it will default to 'Bank Account Transfer'. Therefore merchants upgrading to Release 12 will need to perform following dummy setups in Payments to successfully process receipt and remittance batches. a. From Oracle Payments Setup dashboard, click on Go To Task icon for Payment System--> Payment System. b. Click on Create button and enter following details to create new payment system. Click on Save and Add Accounts. b. 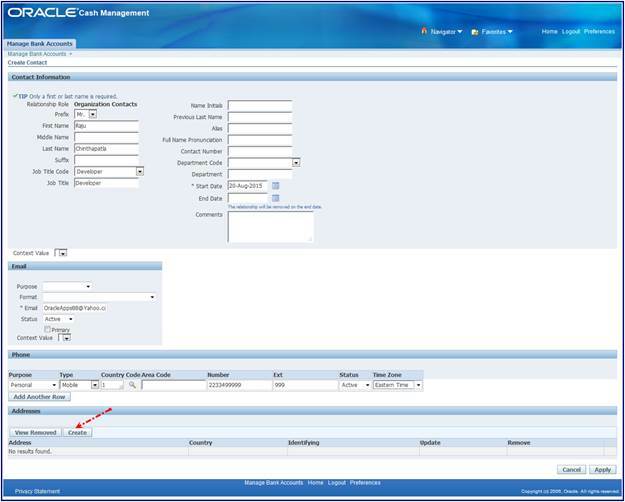 In Funds Capture Process Profiles (FCPP) page, select the payment system created in step II (imprtant) and click on Create button. Enter following detais for FCPP. This completes creation of funds capture process profile. Next step is to associate FCPP with payee to be used when creating settlements. 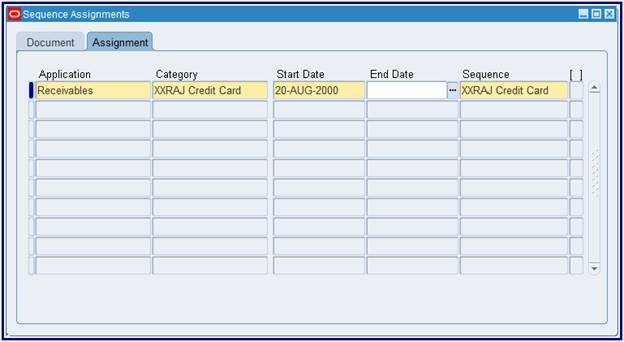 Click on add another row and select Payment system and account created in step II above. Assign operating unit of your choice. Note: Assignment of operating unit will decide whether or not this payee will be used. Save the payee setup. This completes basic payee creation. However, if your business requires using multiple payment system with different settlement file formats (for example country specific formats), then you need to setup multiple payment systems and FCPP and setup routing rules to route authorizations and settlements to proper payment system. 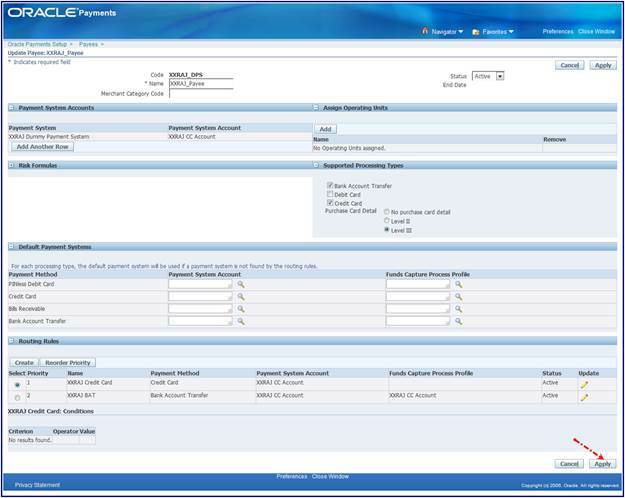 The following details creation of routing rules for the payee. Click on + to expand routing rules and create a new routing rule using the following steps. 1. 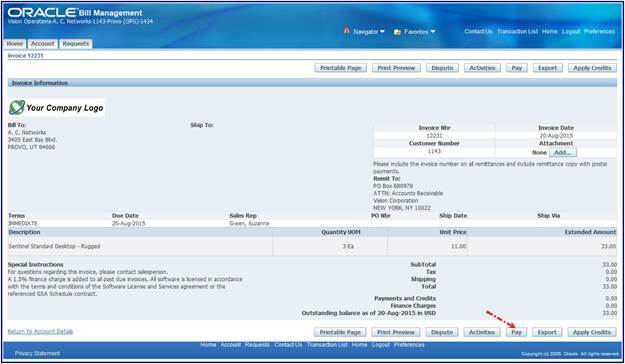 Navigate to the Payment Details subtab of the Account Overview page. 2. Click Add Receipt Method. 3. Search and select an appropriate receipt method. 4. Specify the start and end dates for the method. You can assign a credit card either by adding a predefined credit card or by creating a new credit card. 1. On the Payment Details subtab of the Account Overview page, click Add. 2. Search and select an appropriate credit card. 1. On the Payment Details subtab of the Account Overview page, click Create. 2. Enter credit card details such as number, expiration date, and statement billing address. Note: You can also create a billing address. The following profile options are to be setup at the given levels. 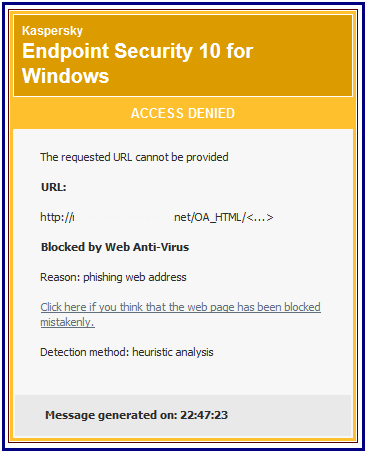 Required to establish successful internal secured HTTP/https connection. Both values are supposed to be same and are not supposed to be modified. 4. The servlet file ideally resides in $IAS_ORACLE_HOME/Apache/Jserv/etc. 5. The Zone.properties file will be edited to link the Servlet and the Payment System created. Do you know why does it not automatically authorize at the time of 'Pay Invoice', it simply creating receipt with dummy PSON and only 'Automatic Remittance' is submitting the card for authorization? we are facing same issue and some setup seem missing. We have a requirement in R12.1.3. Is it possible to Reverse an Credit Card Authorisation and Re-authorise it using Any API in Offline Mode/ batch Mode. The Credit Card Company has come up with a new Policy to6 penalise the Companies if we exceed the Authorisation days limit for Example if we have a Order which is paid through Credit card , the Authorisation is for say 7 days, if we donot fulfill the order due to some delay which will cross 7 days then there will be penalty for the excess days until the order is fulfilled and payment is settled.